The Czechs. I’ve learned some very interesting things about them this time around. Prime lesson number one: Nothing is ever quite straight forward. You approach them and you ask what seems to be a simple question: Can I interview you for a documentary about puppetry? And if so when? I don’t know, maybe my American brain is too fixated on results. Yes or no? Next week, Monday at three? Too hard? Not for me. But for the Czechs? One thing I noticed is that every one of my meetings with Czechs in Prague had little delays. Maybe not now? Why don’t you just drop by? Maybe next week? How long are you in Prague? Fortunately I was quite well prepared emotionally for this obfuscation and non-committal hemming and hawing. First of all I had read the book by Terje B. Englund, The Czechs in a Nutshell. This is a book I highly recommend to anyone who is doing more than a package tour of Prague. Secondly my friend Blair, who had married a Czech girl and really needed a copy of Mr. Englund’s book, had warned me that in his dealings with the Czechs everything seems to get delayed, and if you really want to get things done you kind of have to lean on them a bit, which he said he hated doing. So true to form after some slight delays my interview with Nina Malíková finally happened, a bit later in the process than I imagined. I could tell Marek of Buchty a Loutky had become a bit hesitant about my interview and finally gave me a brief one, when I was beginning to doubt it would happen at all. Tomas was generous with his time. But I never knew when the interview might occur until it did. And I sent multiple emails all around just trying to get their attention. And finally there was the question of Jan Švankmajer. So the way this worked was like this, my friend Silvie communicated with me on the internet that she knew a guy who was involved in Jan Švankmajer’s Surrealist group. Great. She then communicated with him, let’s call him Guy With Italian First Name (Gwifn for short) . So Gwifn writes back saying it depends on when your friend is coming to the Czech Republic. So I sweat blood and raise $10,000 or so for a trip to go interview Švankmajer. Silvie writes Gwifn again. What about October or November? 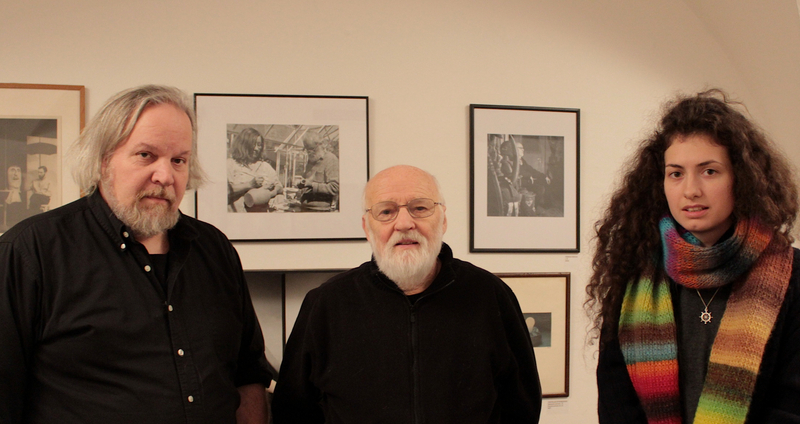 Gwifn says it sounds good, Švankmajer is preparing a major retrospective of his art and films in Prague. It shouldn’t be a problem go ahead and come. Swell! I book the entire trip around this interview. It’s the linchpin of the entire film really. So I come to Europe, get a camera, start interviewing. Everyone has great things to say about Švankmajer. I meet Silvie. But she’s a little worried. She hasn’t heard back from Gwifn. Then his last email note sounded somewhat terse. Hmmm. Okay, I think, it’s the Czech Republic, let it roll. I’m booked at the hotel for twelve days. Then I must go to a nearby town to interview Josef Krofta. The interview with Nina is excellent. The time with Buchty a Loutky is wonderful. Prague has been quite interesting. I’m leaving Monday morning to go to Hradec Králové. The last week no word from Gwifn. I can tell Silvie is really feeling bad about this. She’s frantically sending emails. Gwifn says it will happen when it happens… I’m getting closer to leaving. Silvie is getting close to despair. Finally I hear from Silvie Saturday morning on my way to see the last Buchty show that Švankmajer will see me Monday morning at the gallery at center of town. We both breathe a sigh of relief. Silvie is also desperately looking for a translator, since Švankmajer’s English is as solid as my Czech, and since the delays have made finding someone a real pain. A guy named Daniel volunteers. Okay, I’m sure it’s going to happen. This is one of the sets from Svankmajer’s Lekce Faust his treatment of the Faust story from every conceivable angle. We arrive Monday morning, yes I’ve delayed my trip till the afternoon, at the old town square in front of the building. We enter the building with some trepidation. Several workers stop us. 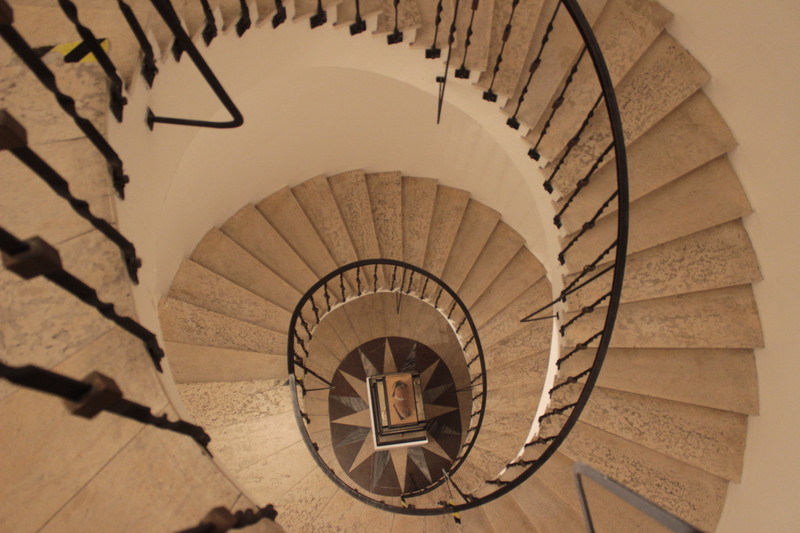 The gallery in the Dům U kamenného zvonu (House of the Stone Bell) is a hive of workmen installing Švankmajer’s years of art, films and other odds and ends. But no sign of the man himself. I let Silvie do the talking. One guy says he isn’t due in till this afternoon. Basically no one knows anything. Now… Mr. Švankmajer doesn’t do email, he doesn’t give out his phone number, he is notoriously hard to reach… on purpose. (I admire that!) We are given the phone number of I believe his wife, must be second wife. Silvie calls her. As Daniel is telling me not to trust Czechs with Italian first names, Silvie jumps up and down! ‘He’s on his way down now!’ We turn around and walk back to the gallery. We run into a small bald man with a serious white beard. It’s Jan Švankmajer! We pass our dobry dens to him. He smiles and let’s us follow him. He seems to know what’s going on. We walk passed shelves and displays of his creatures from his films, posters of same. Statues made of bones and feathers. 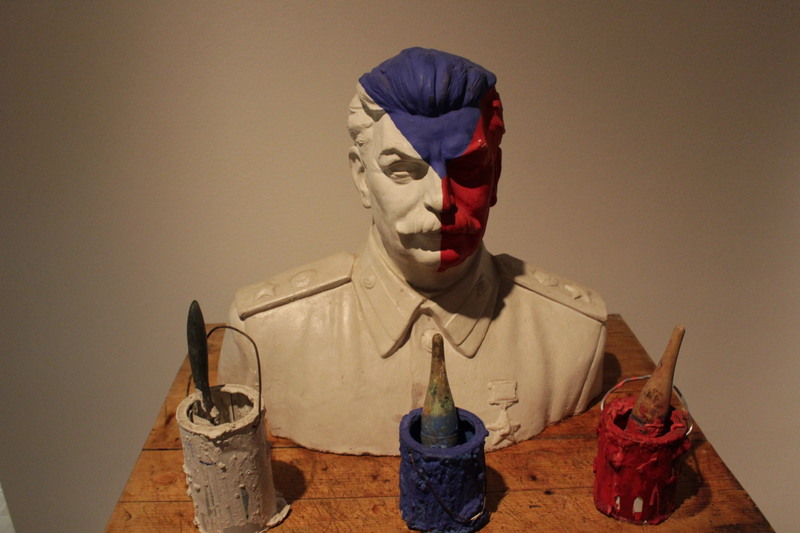 A bust of Stalin painted like the Czech flag. 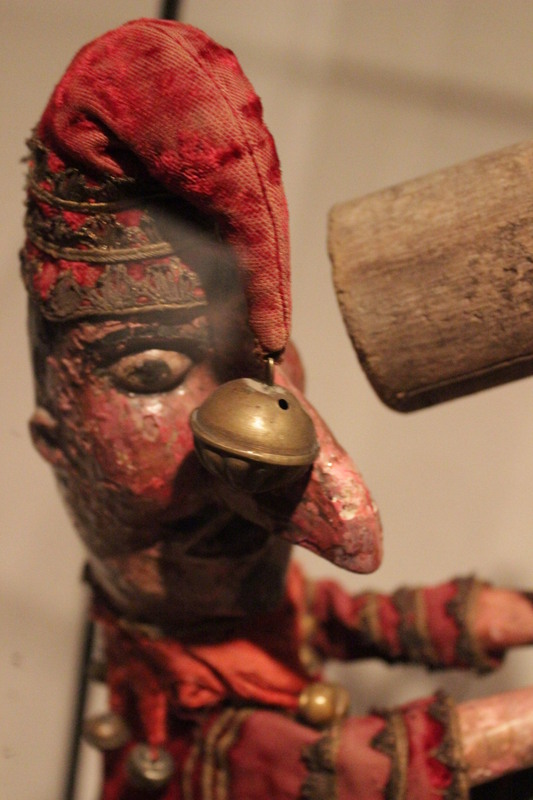 And even the Punch/Kašpárek character from Rakvickarna. It’s about to happen, he says give him some time. Then Silvie comes back crestfallen. Gwifn, remember him, didn’t mention to him that that this was a documentary interview! Švankmajer simply thought this puppeteer from Alaska had come to meet him. As a matter of fact Silvie said when she told him he let loose a few choice Czech curse words. She was pretty nervous actually. But she just stood there, pretty and forlorn. He smiled and said that he couldn’t do it today. I’d have to come back tomorrow. I grab the train to Hradec Králové. Get there in two hours. Get to sleep. And, oh yeah, I’ve got another interview with Jakub’s father the legendary Josef Krofta. This is the man who essentially changed Czech puppetry in the 70’s. Krofta was a crucial figure. I dropped into his office at the Magistraat where he had become a cultural figure in local politics. He drove me over to the DRAK theatre building, which I had visited back in 2005, where I bumped into Milan and Filip, who had been there then. Mr. Krofta, had busted a blood vessel in his eye, giving him a sort of wounded quality. He like Švankmajer was an aging lion. Our interview was all I could hope for. And again another place I wished I’d scheduled for a day or two longer. 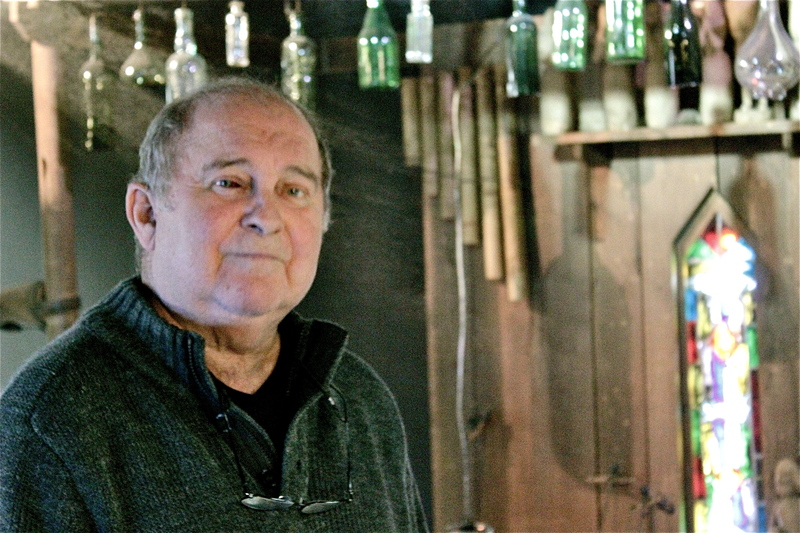 Josef Krofta, the highly influential puppeteer and theatre director from DRAK in Hradec Králové. But now I really had to leave. Josef drove me to the station where I hopped back on the two hour train to Prague, meeting Silvie and a new interpreter, Nina, at 2:30. We entered the building… with a bit of anticipation. I was fully ready to cancel the Vienna portion of my trip to come back if I had to. By this point I wasn’t surprised by anything. Maybe I was becoming somewhat Czech. 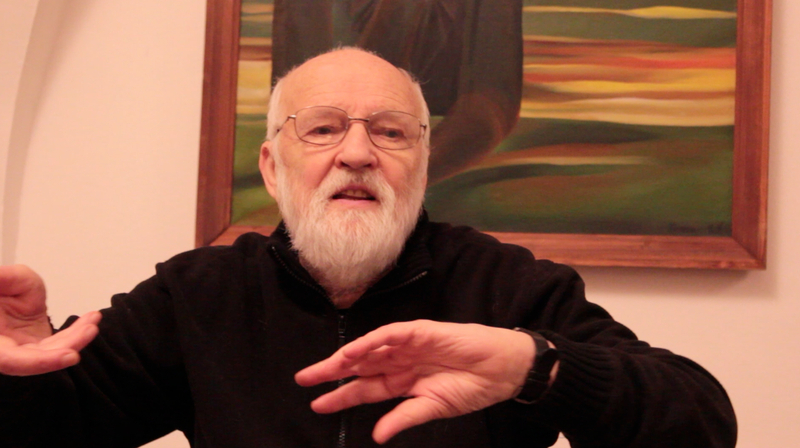 But Švankmajer smiled when he saw us and the interview was on. And, with Nina providing thorough translation needs, the interview was a complete success. He even gave me what might be the final lines of the film. For my part I felt like all of that time reading puppet history and watching his films had finally paid off. I looked over at Silvie, she was beaming. It was a huge moment for her as well. 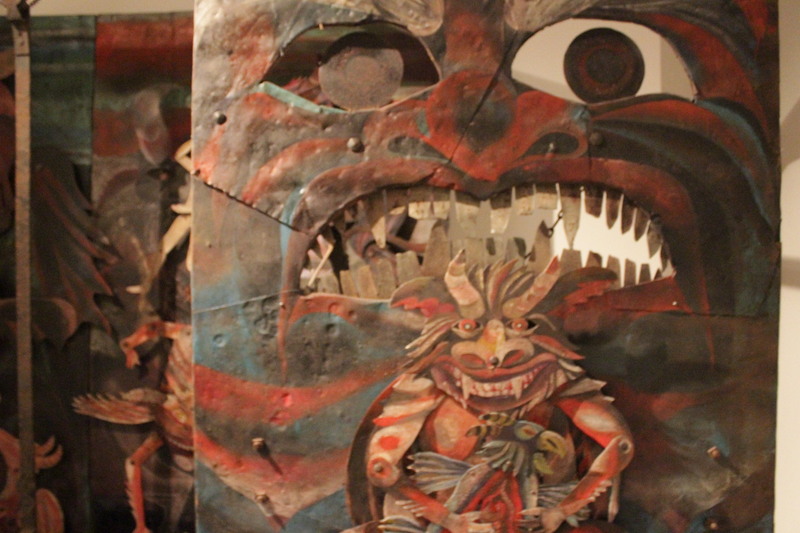 This retrospective on Švankmajer was a serious artistic triumph for the man. Both Silvie and Nina felt a certain awe at being in the presence of such a national artistic figure. 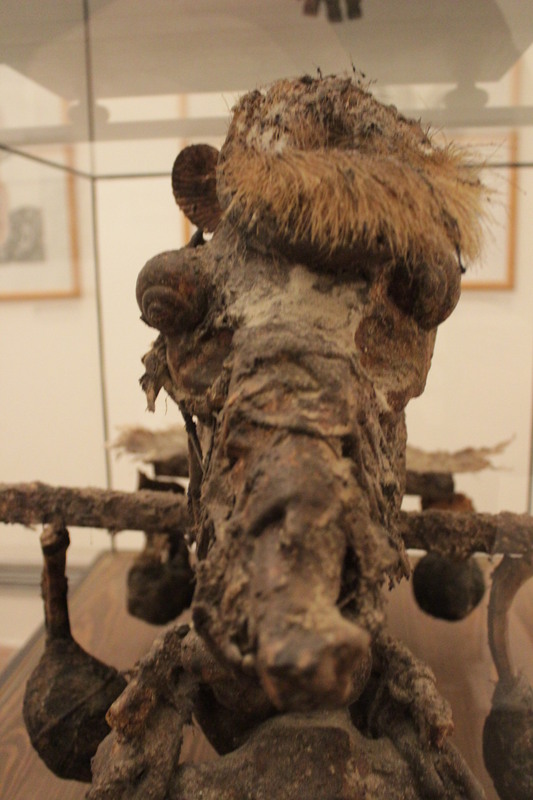 I was walking back through the exhibition once last time to get a few photos when I saw Švankmajer. He smiled at me in a friendly way and then continued walking ahead of me and turned the corner. I kept going to the end of the hall but he was gone. And that was the last I saw of him. I won’t spoil the contents of the interview for you. But I will say this, the ride back to my tiny room in Hradec Králové was very peaceful, even satisfying. The documentary now had a center. I felt a deep gratitude. Now it was back to Poland once again… this time to interview perhaps a more formidable figure… puppet historian and philosopher Henryk Jurkowski.